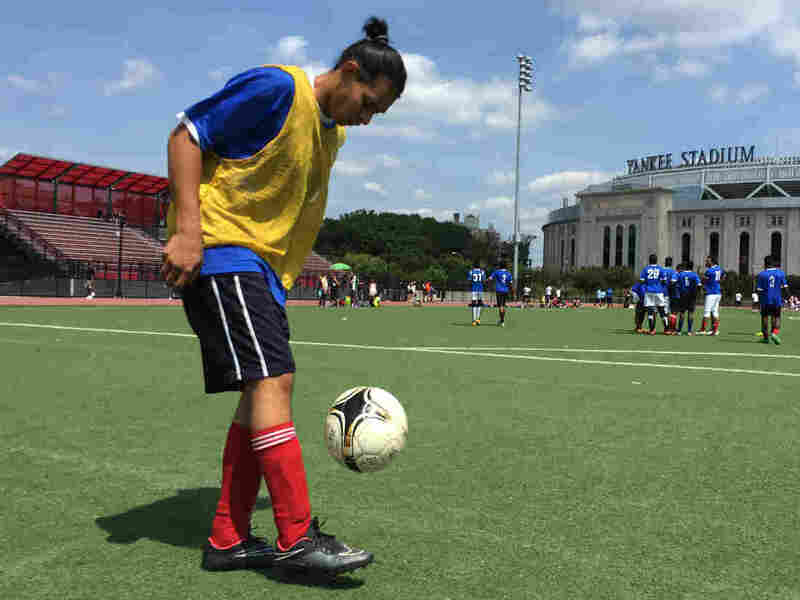 Through Soccer, Teen Migrants Rebuild Lives And Get Chance To Meet Pope During his U.S. visit in September, the pope is set to meet with unaccompanied minors from Central America who have formed a youth soccer team co-sponsored by New York's Catholic Charities. Carlos Alfaro, 19, practices with a soccer ball before a match in New York City. Some members of his youth soccer team are set to meet with Pope Francis in September. After sitting down with President Obama, addressing Congress and speaking at the United Nations, Pope Francis will meet with some unique soccer players in New York City in September. They're migrant teenagers in a youth soccer program co-sponsored by New York's Catholic Charities. Many of them fled Central America and entered the U.S. illegally among the tens of thousands of unaccompanied minors who crossed the border last year. Now, they are living with relatives or other sponsors in the U.S., waiting for immigration court hearings to determine if they can stay. For Carlos Alfaro, 19, the chance to spend some time with Pope Francis — along with other immigrants during the pope's stop at a Catholic school in New York — is an unexpected opportunity after leaving his family in Honduras two years ago for the U.S.
"I'm here so I can help my family and get support for them, all of my family, my brothers and sisters," Alfaro says. Spending Saturday afternoons on the field in cleats and shorts is now his weekly ritual in New York. "Soccer is my passion," he says. "I play soccer when I can." So do about three dozen of his teammates, some of whom are applying for asylum, according to Elvis Garcia Callejas, a migration counselor at the Catholic Charities of the Archdiocese of New York. 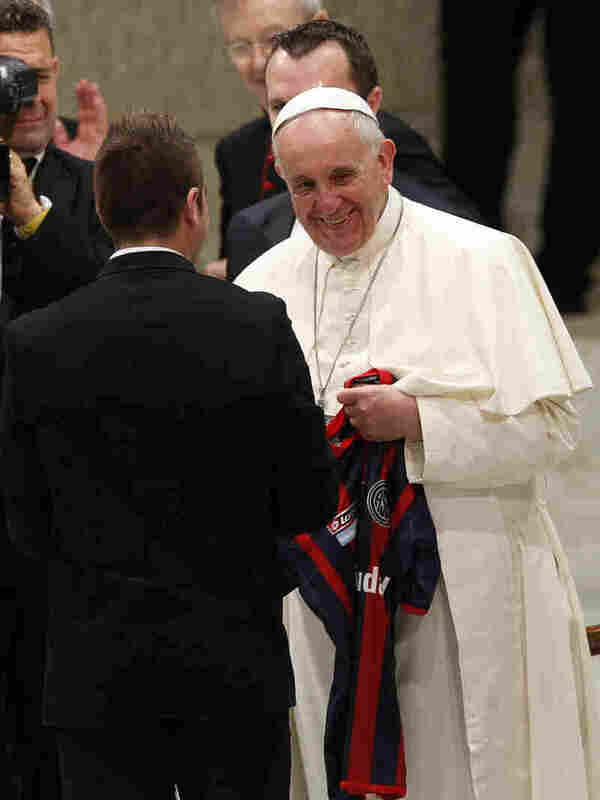 Pope Francis is given a San Lorenzo soccer team jersey by players at the Vatican in 2014. "Soccer in a way makes them forget everything," says Garcia Callejas, who helps coach the team with staff from South Bronx United, an organization that runs youth soccer programs in New York. "Sometimes you see them in immigration court really worried, and then you come see them play soccer. They are kids again." Garcia Callejas was once a 15-year-old kid himself from Honduras. Before he became a U.S. citizen, he says he hitchhiked and rode on tops of trains alone to escape violence and find better opportunities like this younger generation of unaccompanied minors. "A lot of them have come to the U.S., looking for a safe place. A lot of them have come because they want to reunify with their parents. A lot of them came because they were too poor in their country," he says. But at least for a few hours on the fields across from Yankee Stadium, the drama is focused on the soccer pitch — or on the sidelines, where second-stringers often stomp and groan while they wait for their turn to play. Garcia Callejas says some of his players have used their downtime to prep for the pope's visit, looking into the Buenos Aires soccer club San Lorenzo, the pope's favorite team. Eighteen-year-old Ariel Mejia says he's seen Pope Francis downplaying his soccer skills in a recent interview with TyC Sports of Argentina. "He says he's terrible," Mejia recalls with a laugh. Still, Cristhian Contreras, 16, says he's looking forward to meeting the head of the Catholic Church. That's because, Contreras explains in Spanish, "the pope's from the Americas, and he speaks Spanish." But that's not all the pope and these teenagers share. There's also their passion for the beautiful game.